In 2013, NC’s legislature ordered an experiment to try and improve water quality impairments in Jordan Lake. Detailed in past posts, the study’s goal is to see whether solar powered mixers are a way of helping improve water quality in the Jordan Lake and reducing algae levels, a condition which has landed the lake on the state’s list of impaired waters for over a decade. A year after the mixers were installed, NC DENR has released a “preliminary” report analyzing this experiment. This summary looks at 6 monitoring stations before and after the installation of solar powered mixers. While labeled as preliminary, the summary shows questionable benefit of the mixers at the analyzed stations. 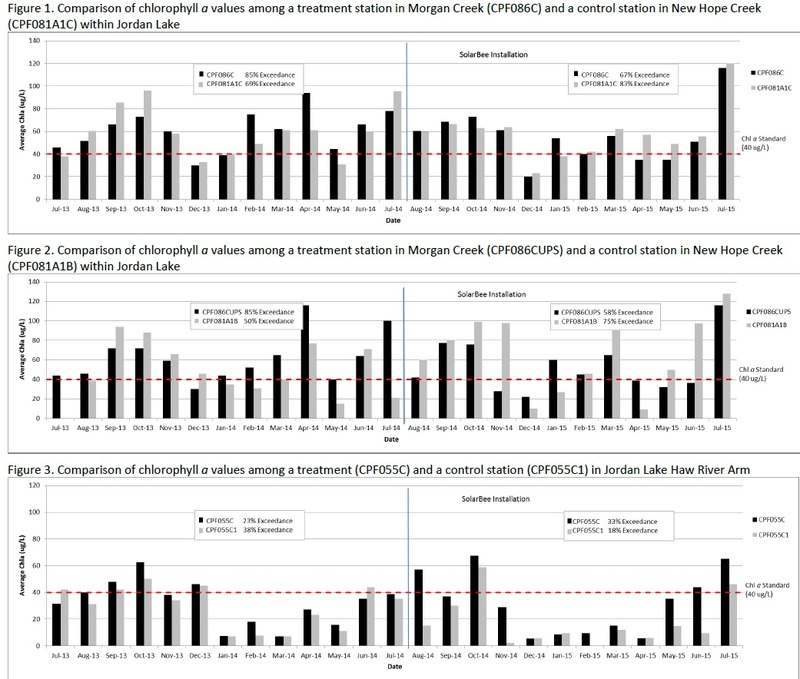 Half the stations analyzed in the report showed declines in water quality while half showed improvement. Further, no stations improved to the point where they were no longer considered impaired by NC DENR.